"Sampath Speaking" - the thoughts of an Insurer from Thiruvallikkeni: slave tetris ~ what a nauseating concept !! Most parents are none too pleased when their kids watches and enjoys ‘Wrestle Mania’ a professional (!) wrestling promotion. WWE first produced the event in 1985 to be its premier annual event and has since produced thirty editions, with the thirty-first scheduled to be held in Santa Clara, California. WWE, TNA, ROH and many more … all names of Wrestling shows that are shown on TV – ask your children of chokeslam; frog splash; brainbuster; taste of pain; sleeper with body scissors; tadpole splash; patriot lock; tombstone; 619; bombshell; bull hammer …… !! to parents such shows could be nauseating and would feel that their children should never see these shows; .. but children are already addicted to them. Sometime back, Interactive announced WWE Immortals, a free-to-play mobile game – there are similar games that are gory, violent, including many fatalities – but this one, as a concept itself, is nauseating, yet supposed to be a children’s educational game. 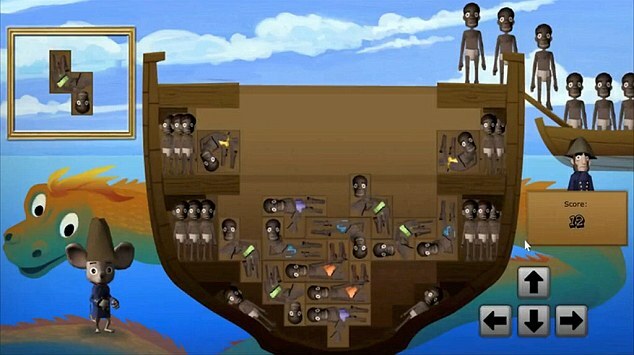 A section of Slave Trade, recently discounted on Steam, saw the players stacking slaves in a tasteless challenge called ‘Slave Tetris’.The portion of the game, which has now been pulled from Slave Trade, was allegedly intended to show children the horrors of how slaves were cramped into ships – but turning it into an addictive game has understandably left a very bitter taste on social media. A Danish video game company has removed the "Slave Tetris" portion of their recently discounted Slave Trade game, expressing a baffling sense of bemusement at the explosion of controversy initiated by the game's arrival on the distribution platform Steam. What exactly was included in the now-deleted Tetris portion ofSlave Trade? Were people between the ages of 11 and 14 actually stacking human beings like blocks for fun? - it reportedly was the game in which players had to squeeze as many Africans as they can into a ship's hold ! Tetris, is a Russian tile-matching puzzle video game, originally designed and programmed by Alexey Pajitnov, released in 1984. The name is derived from the Greek numerical prefix tetra- (all of the game's pieces contain four segments) and tennis, Pajitnov'sfavorite sport. It is the first entertainment software to be exported from the USSR to the US and published by Spectrum HoloByte for Commodore 64 and IBM PC. This popular game (or one of its many variants) is available for nearly every video game console and computer operating system, as well as on devices such as graphing calculators, mobile phones, portable media players, PDAs, Network music players and even as an Easter egg on non-media products like oscilloscopes. While versions of Tetris were sold for a range of 1980s home computer platforms as well as the arcades, it was the hugely successful handheld version for the Game Boy launched in 1989 that established the game as one of the most popular ever. "Tetriminos" are game pieces shaped like tetrominoes, geometric shapes composed of four square blocks each. A random sequence of Tetriminos fall down the playing field (a rectangular vertical shaft, called the "well" or "matrix"). The objective of the game is to manipulate these Tetriminos, by moving each one sideways (if the player feels the need) and rotating it by 90 degree units, with the aim of creating a horizontal line of ten units without gaps. When such a line is created, it disappears, and any block above the deleted line will fall. When a certain number of lines are cleared, the game enters a new level. As the game progresses, each level causes the Tetriminos to fall faster, and the game ends when the stack of Tetriminos reaches the top of the playing field and no new Tetriminos are able to enter. Some games also end after a finite number of levels or lines. On Monday Egenfeldt-Nielsen bowed to pressure and removed the segment from Playing History: Slave Trade, though the rest of the game is still available on digital game store Steam. He however, defended Slave Tetris, saying on Twitter the 'point [was] to disgust people so they understand how inhumane [the] slave trade was.' He went on to add that it was only a 15 second part of a two hour long game where participants play as an escaped slave, reports The Daily Mirror. The game was branded 'dehumanizing and anti-black', causing Egenfeldt-Nielsen to admit the controversy over 'Slave Tetris' had 'overshadowed the educational goal' of the rest of the game. In a series of responses to irate Twitter users he admitted he, 'should of course [have] know[n] how this would have played out,' adding, 'My naivety will be my doom. ''The goal was to enlighten and educate people — not to get sidetracked discussing a small 15 secs part of the game.